Up to 6 Personalized Voice Reminders to Help Remember Meds, Appointment, etc. We have listened to our customers' many requests for an alarm clock type medication reminder that has a loud alarm, can "talk" in your own voice, and has a long alarm. Long Alarm Duration (60 minutes) - Never forget your medications again! 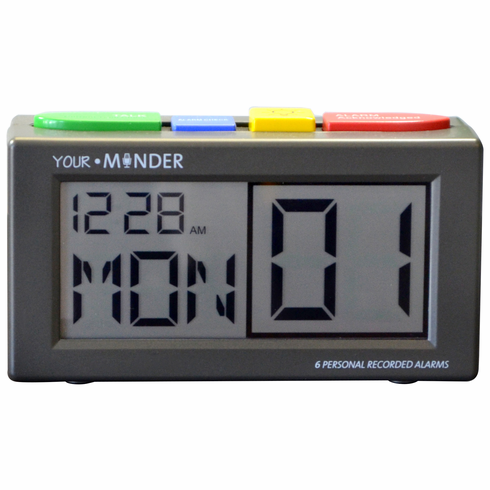 The complete MedCenter Alarm Clock includes batteries and AC adapter. Record up to (6) of your own alarm messages to alert users when it's time to take medications, get out of bed, walk the dog, etc. This alarm Clock resets automatically every day at midnight. Warranty: One (1) Year by manufacturer MedCenter Systems (Your Minder) | 30-Day Money Back Guarantee. Battery: 2 x AA (included) and AC adapter (included). Display: Easy to read display with large digits. Day of Week digit 5/8 inch, Date digit(s) 1 1/4 inch. Backlight display.